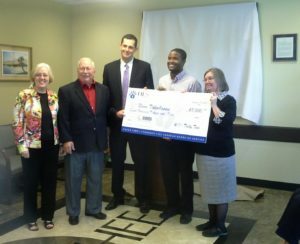 Tallahassee, FL – On November 20, 2013, Attorney Liebenhaut along with TallyTIES co-founder, Brian Sealey, delivered a check to NAMI-Tallahassee for $8,000.00. NAMI-Tallahassee is the local affiliate of NAMI (National Alliance on Mental Illness) serving Leon and surrounding counties. Founded in 1979, NAMI has become the nation’s leading voice on mental illness. NAMI is the largest grassroots advocacy organization addressing mental illness and as the way people whose lives have been affected by mental illness find their individual and collective voice. The check was delivered at Apalachee Center as part of a beautiful celebration of NAMI-Talllahassee’s partnership with Apalachee Center. For over half a century, Apalachee Center has been dedicated to helping the individuals and families of North Florida succeed in recovering from emotional, psychiatric, and substance abuse crises. The partnership between NAMI and Apalachee Center will help to spread awareness of the support system and resources NAMI makes available to loved ones of those living with with mental illness.